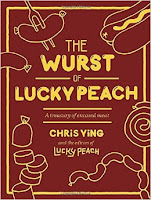 The best in wurst from around the world, with enough sausage-themed stories and pictures stuffed between these two covers to turn anyone into a forcemeat aficionado. Lucky Peach presents a cookbook as a scrapbook, stuffed with curious local specialties, like cevapi, a caseless sausage that’s traveled all the way from the Balkans to underneath the M tracks in Ridgewood, Queens; a look into the great sausage trails of the world, from Bavaria to Texas Hill Country and beyond; and the ins and outs of making your own sausages, including fresh chorizo. 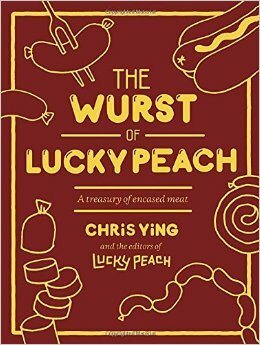 We all know my weakness for awesome cookbooks and summer is officially here, so I thought a book about sausages would be perfect! Well, I was right and I was wrong. This book, while advertised as a cookbook, isn't a cookbook. In fact, it only has about 40 recipes. The book is far more about the history and types of sausage. Unfortunately, it feels like it's suffering from a bit of an identity crisis. So, while a disappointment as a full fledged cookbook, this book is still fantastic. Honestly, it's worth it just to read the rants about ketchup and mustard. If you're interested in learning about types of sausage, the geography of sausage, or even read short travelogues done by people traveling for sausage, this full of personality book might be for you. If you're looking for a cookbook, give this one a pass and keep your eyes open for a book stuffed with sausage recipes. Stuffed..get it?